Everyone I have met through the program has been very nice and good to work with, one student says. Students describe fellow students as "charismatic, dedicated, and intelligent," as well as "helpful" and "eager to learn." They enjoy working together and say they can learn a lot from each other. Most students seem to be commuters or involved in Int...Everyone I have met through the program has been very nice and good to work with, one student says. Students describe fellow students as "charismatic, dedicated, and intelligent," as well as "helpful" and "eager to learn." They enjoy working together and say they can learn a lot from each other. Most students seem to be commuters or involved in Internet courses; however, those who do live on campus have the option of living in the school's apartments and dormitories. Commuters remark on the location's convenience, but admit they do not really engage in life on campus. There is an MBA Student Association that organizes weekly discussions and other social activities for those who wish to participate. Also, "many activities and student organizations cross the line between undergraduate and graduate, so there is never a problem networking with students from a variety of disciplines." 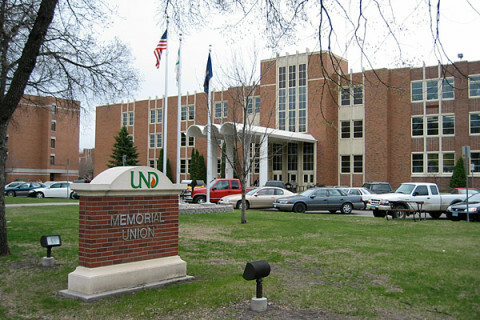 If students seek further recreation, the North Dakota Museum of Art is located right on the UND campus. Also, the school has a hockey team, which students "take pride in." They also mention that the "gym facility is outstanding." Grand Forks is a city with a population of roughly 53,000 people. It sits on the western banks of the Red River of the North, just 75 miles south of Canada. An international student says North Dakota is "a safe and easygoing place where foreign students can easily concentrate on their studies and become familiar with American culture." “The greatest strength of the University is its commitment to its students. There is no doubt in my mind that UND does everything in its power to help its students succeed.” Career services at UND assist both undergraduate and graduate students with intern­ship and job placement. The office offers career counseling and hosts an annual career fair each fall. In the spring, it coordinates on-campus interview sessions. Some students wish there were a separate fair specifically for the College of Business and Public Administration. The three most popular career fields after graduation are manufactur­ing, the military, and financial services. “Life in Grand Forks is not as diversified as that in big cities. However, we have good social events and networks with the companies around the Midwest.” The placement percentage for the business school (graduate and undergraduate) is 97.2 percent. UND alumni have high positions at some of the follow­ing companies: Bank of America, Coca-Cola, General Motors Defense, and Nodak Electric Cooperative. Want more info about University of North Dakota College of Business and Public Administration Full Time MBA? Get free advice from education experts and Noodle community members.